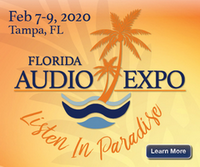 Axpona 2019 is going to be larger than ever. And, no audio show can be complete without an AS dinner. We are only 4 weeks away from the show so I'm willing to get our dinner organized. I'm thinking Saturday evening at 7:00 pm. Please provide preference and commitment to participate. I will book the restaurant this week. I plan to go this year. I'll have my grandson and one other friend who we traveled with, if that's alright. No hard preference on restaurant, I'm assuming they are nearby. Got you down; Peabody party of 3! Missed you at FL Expo Marty. No need for any pst changes, I'm not used to adding my name. Please provide preference and commitment to participate. I will book the restaurant today. Enjoyed the dinner last year, and would like to attend. Any of the three choices is fine.